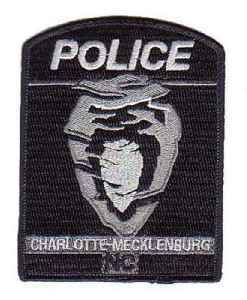 The Charlotte-Mecklenburg Police Department is the police department of Mecklenburg County, North Carolina, United States, which includes the City of Charlotte. With 1,849 officers and 473 civilian staff as of 2014, covering an area of 438 square miles (1,130 km2) with a population of nearly 900,000, it is the largest police department between Washington D.C. and Atlanta, Georgia. Hours after Charlotte-Mecklenburg Police release body camera footage of an officer shooting an armed man last month, protesters gathered to question the department's policy and demand change. (April..